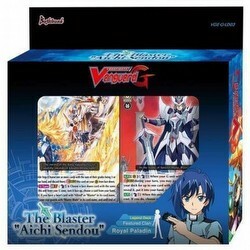 The Blaster Aichi Sendou is the third in the popular Legend Deck series. Royal Paladin units that Aichi Sendou has been using are featured, with all new abilities. As a complete deck with powerful units and attractive new illustrations, and additional items compared to the standard Trial Deck, The Blaster Aichi Sendou is the perfect pre-constructed deck set for both new and veteran players alike!! Look for hot stamped cards randomly inserted into decks. Each pre-constructed deck contains 58 cards (50 card deck + 8 G cards). There are 15 different cards included, including 3 G cards. There are a total of 18 holo RRR cards (1 of each). Also included are a special Aichi Sendou deck case (folded), a special Aichi Sendou Fighter's Counter, a special Aichi Sendou Clan card, 2 copies of a special promo card (Holy Dragon, Religious Soul Saver), and a paper play mat.